HomeBlogArticlesWhat is a Hearing Test? The use of a word as unassuming as ‘test’ in a medically-related context can create very different emotions based on the personal views and health history of the reader/listener. For some people, any such mentions of testing can have negative connotations, perhaps due to the lingering influences of stressful finals in high school/college or the tendency to focus on the undesirable while awaiting the date of a particular medical examination; for others, any testing is seen as a positive action/step that can produce a baseline, confirm the results of a course of treatment, establish a specific direction, or isolate a root cause. While it is understood that the latter mindset is sometimes (often) easier said than done, it is an outlook that can and should be adopted in relation to evaluating one’s hearing. A Hearing Test is essentially an assessment of how well a person is able to hear sounds; it is a painless and non-invasive diagnostic procedure, customarily performed by a hearing specialist (audiologist), to screen for hearing loss in adults ages 18 and up. Any degree of hearing impairment can and will have an adverse impact on quality of life, not only for the individual, but also those with whom they interact on a regular or casual basis. It is therefore recommended that adults have a baseline hearing test performed at least once prior to the age of 60 years, in order to establish a reference or comparison level should a future test be needed due to perceived/actual hearing loss; an established baseline will help in assessing the severity of any subsequent hearing loss as well as the most appropriate form of treatment. Individuals who suspect that they may have some degree of hearing loss/impairment or those wishing to have a baseline hearing test conducted for future reference can request a hearing test by a hearing instrument specialist at Bravo Hearing Centre in Toronto by visiting our Book a Hearing Test page. Furthermore, individuals may not be aware that they already have some hearing loss yet are subconsciously making subtle adjustments while at home or at work to compensate; in many cases, these modifications might only become apparent when pointed out by a family member, friend, and/or colleague. 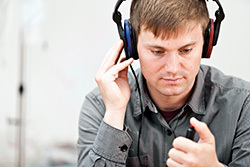 Under such circumstances, a follow-up visit to a hearing test centre, such as Bravo Hearing Centre in Toronto, is highly recommended; for more detailed information on this subject, read our Article on: What to do if you find that you are not able to hear properly. Qualified hearing instrument specialists like the professionals from Bravo Hearing Centre can perform hearing tests for Adults of the age 18 and up. The method of testing varies depending on the age of the patient. In addition to requesting baseline hearing tests and assessing and monitoring changes in hearing over time, the choice of hearing clinic can also play an essential role in the hearing health of an entire family. 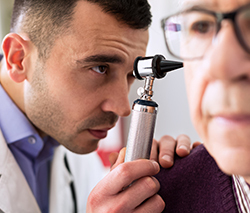 Even if there is no immediate need for professional hearing services, researching/having knowledge of hearing clinic options within Toronto will undoubtedly prove beneficial at some point in the future. One such clinic is Bravo Hearing Centre, a full-service facility that offers much more than hearing tests and is staffed by award-winning specialists committed to providing the utmost care and attention to each and every patient. For additional information on the full scope of products and services offered by Bravo Hearing Centre in Toronto, please see our Hearing Clinic in Toronto page. For any and all hearing needs for you and your family, including baseline hearing tests, hearing loss assessments or complete audiological hearing loss assessments, call Bravo Hearing Centre today at 647-694-4626 to book a consultation with one of our hearing instrument specialists.